This Spanish pianist and composer was born in Camprodón, Spain on the 29th of the fifth month of 1860, his father was a customs official Ángel Albéniz and his mother's name was Dolors Pascual. The young Albéniz was a child prodigy who first performed for the Barcelona public at the age of four. Three years later he was refused admission to the Paris Conservatoire on the grounds that he was too young, this after he had passed the entrance examination for piano. 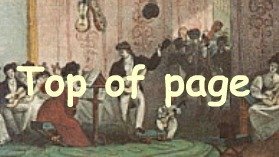 At age nine he, along with his sister Clementina, embarked on a concert tour throughout northern Spain, all administered by his father. After many attempts to run away from home, Isaac successfully stowed away in a ship bound for Buenos Aires in 1872, from where he made his way to United States of America via the island nation of Cuba - This story is disputed by some who claim he traveled to Cuba with his father the customs official , perhaps it was from Cuba that he ran away to the USA. In that North-American country he gave concerts in New York and San Francisco, and then travelled to Liverpool, London and Leipzig. After a short stay at the Leipzig Conservatory in Germany, in 1876 he went to study in Brussels, Belgium. He also attempted to study with Franz Listz, traveling to Budapest to do so, but this endeavor was never successful, apparently due to that Maestro's unavailability. By 1893 he had settled in Paris composing works for the piano, in particular so called salon style works similar to the waltzes, mazurkas and so forth of Frédéric Chopin, Robert Schumann, Ludwig van Beethoven, and Franz Liszt. His first published composition Marcha Militar had appeared in 1868. It was the teacher and composer Felip Pedrell, whom he met in 1883, that encouraged Isaac Albéniz to write music that was uniquely Spanish. Pedrell was a leading figure in the development of nationalist Spanish music, and instilled in Albéniz an appreciation of the wonderful values inherent in Spanish music. Compositions such as his Suite española, Op. 47 followed which was characterized by its delicate, intricate melody and abrupt dynamic changes. Prominent also in his compositions, is the use of harmony and melody popular in the gypsy music of Spain - flamenco. A particular style within flamenco known as cante jondo was used, this often dealing with themes of death, anguish, or religion. Albéniz’s influence on the future of Spanish music was profound. His activities as conductor, performer and composer significantly raised the profile of Spanish music abroad and encouraged Spanish music and musicians in his own country. 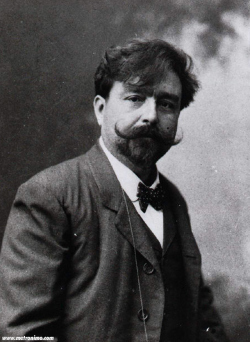 Many of Isaac Albéniz's piano compositions have been transcribed for the classical guitar, indeed the composer commented that he preferred the transcriptions by Francisco Tárrega to his piano originals! 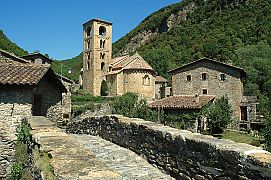 Among these include the ever popular Asturias, as well as Granada, Sevilla, Cadiz, Cordoba and the Tango in D, and the Duo of John Williams and Julian Bream effectively rendered the opening Evocation from the masterpiece Iberia. Find your favourite Isaac Albéniz Sheetmusic at this page! 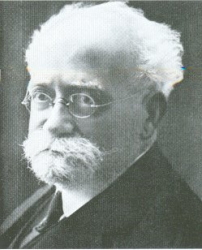 Albéniz had been suffering from Bright's disease (a disease of the kidney) for nine years when he succumbed at the age of 48 on the 18 May, 1909. He is buried in Barcelona. Alberto Ruiz-Gallardón, a Spanish politician and Mayor of Madrid, and Cécilia Sarkozy, the former wife of French president Nicolas Sarkozy, are two of Isaac Albéniz's great-grandchildren.